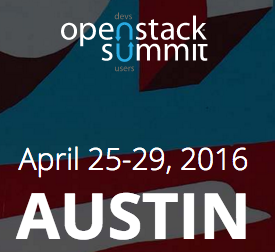 This year I attended OpenStack Summit in Austin, Texas from Apr 25th - 29th for the first time. As it wraps up today and I am heading home, I wanted to look back and share what you missed from my perspective. As an application developer focused technology evangelist is has been a lot of fun shifting into the infrastructure, container, management and Cloud based technologies that encompass the Red Hat product portfolio, instead of just focusing on the middleware JBoss space. OpenStack Summit was the place to deep dive into the markets, technology, developers and users of the OpenStack platform, one of the core technologies from my new favorite Red Hat Cloud Suite product. If you look at the architecture of the Red Hat Cloud Suite you will find OpenStack is a pretty prominent technology and Red Hat has a large presence at the OpenStack Summit this year. It kicked off with a keynote session that started off strong with a visionary look at Bi-Modal IT as the Foundation for Digital Business from Gartner's Donna Scott. Nice to see that they are fully invested in the ongoing story around digital business dealing with mode 1 and mode 2 together to continue to grow the business that is 20% of revenue coming out of mode 1 right now, projecting to 40% with oncoming mode 2 driven digital business revenue. Some cool slides and themes of cartoons were used in all the venue with some interesting numbers of 75 attendees in 2010 becoming 7500 attendees today in 2016! Well done and pretty well organized event. The rest of the 'keynotes' sort of bled into a blur of 10 minute by AT&T, Marantis (who's message was backed by gansta clothes and video of vodka drinking Russians, very weird...), SAP, Red Hat and Volkswagen all showcasing their use of OpenStack. I tried to attend OpenStack Infrastructure for Beginners but was blocked at the door being told it was overloaded. While next door there was a room for a talk about TOC of OpenStack with 100's of open seats... don't you hate it when that happens? 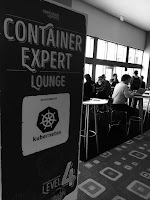 After lunch I spent a few hours with Scott McCarty at the Container Experts Lounge meeting and discussing all manner of application development in containers and on Clouds. I met a lot of people here, love this about meeting and chatting with all these developers out there. 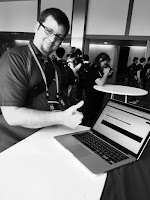 I even got down and dirty with Red Hat Container Development Kit (CDK) along with Red Hat Cloud Suite example applications that are available on Red Hat Demo Central. The visitors to the lounge enjoyed these with more than a few stating that they planned to examine them later in more detail. There were a few sessions that rated an in room sketch artist working live on a blank sign and picking up some of the topics, subjects and examples during the talk to translate them to the sign. This was really cool and many examples were then lined up along the wall during the talks that came later so you could browse these mind map like displays. 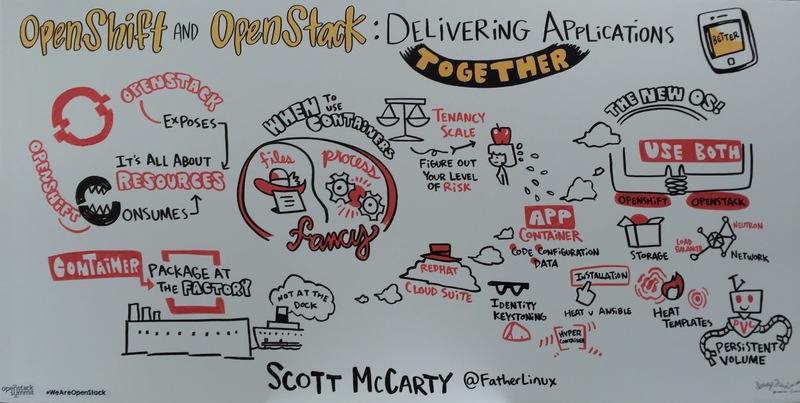 Scott McCarty gave a dynamic and fast paced session covering how much better your life can be if you use OpenShift and OpenStack together. Not only did he cover the topic he did a live demo of how this can work on stage, with his laptop hosting I believe he said a nested VM image series of 4 VM's. All the while Scott was talking, next to the stage this artist was doing a live sketch of what was being covered in his session, amazing to watch this unfold. happened, here are the final results! After that the marketplace opened up to host a booth crawl and the Red Hat booth was swamped with attendees looking to check out the OpenStack pods, get a hat, grab a t-shirt and tell us how much they love the story Red Hat is bringing to market. Personally, I was amazed to bump into old friends and colleagues from all over the world that were passing through to catch up on OpenStack and networking. Spent time at the Rackspace Cantina setup down the street with old colleagues, had lunch with a small group of new Red Hat colleagues and drinks in the marketplace with people from Asia, Europe and NA. I kicked off day 2 with a longer breakfast with colleagues discussion the past days events, comparing notes from our evening and planning out the rest of day 2. The keynotes were not that exciting so headed off to catch some of the technical session. In a super small room the first was Container Based Dynamic Service Chaining and Injection, where most of the attendees were left standing in the back of the room. It was a deep dive into a small new project that was putting APIs into their service chains to allow for external applications to dynamically modify a service in the chain. Another talk was Learning You Some OpenStack for Great Good by Rackspace, which was just an overview around OpenStack and Clouds and a small demo that was not very coherent and limited by the venue networking. A real problem with OpenStack demos has been that they are not running locally and networking will always be a issue. Standing room only in Container Security talk. Spent some time today just hanging around the Red Hat booth having conversations with people from all over the industry. 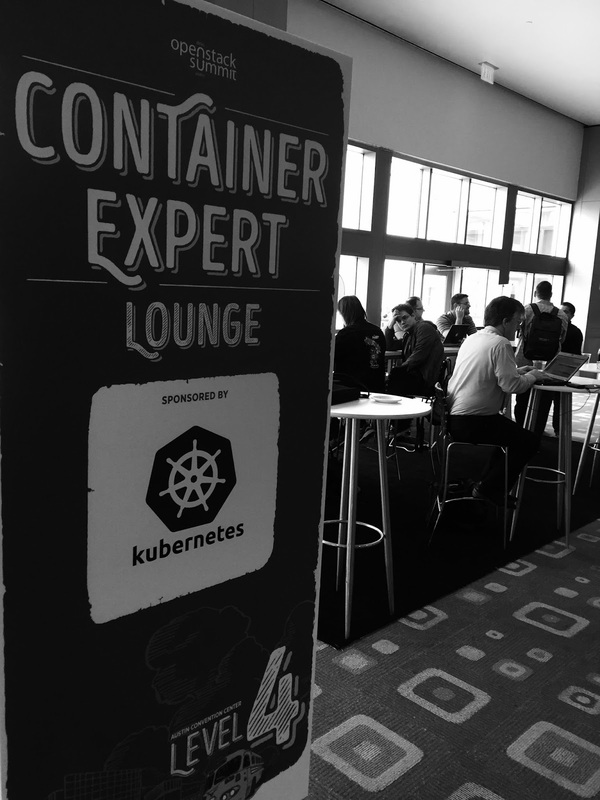 Lots of interest in container technologies, how Atomic OS fits into the story, what Red Hat Cloud Suite brings to their solution strategy and a lot of interest in the swag that flew out the door on day 1. The marketplace where all the booths are located was buzzing the entire time it was open, not at all dead during sessions, amazing energy captured there that would be good to see at other conferences. Had lunch with several colleagues from Ansible fame, talking about community growth and how the integration into Red Hat has been going as their technology is bringing value to several product lines. The afternoon session I caught was by Thomas Cameron talking about container security which drew standing room only crowds. New insights into Red Hat and the thoughts they are having with regards to securing these pesky containers as they grow in your enterprise. Then the evening came around where we all hit the Red Hat party at Bangers on Rainey Street. This was a huge blowout with lines to get in all the way up to closing. Music, over 100 beers on tap, BBQ running and live armadillos which might be the Texas state animal. Lots of laughs, meeting up with friends and old colleagues along with the new, good times had by all. This day started the Containers and Telecom/NFV tracks kicked off. I sniffed around in a few sessions and think that I found the smallest room for giving a talk at OpenStack Summit, only 30 chairs and it felt like you were in the front row no matter where you sat (see picture)! After lunch we had a partner event over at Rackspace Cantina where we mingled and enjoyed the drinks while chatting about the Red Hat products tied to Rackspace hosting solutions for the Cloud. I also joined a talk called Is That A Cloud in your Pocket. Very funny analogy from an APAC friend of mine how it is easy to put together your OpenStack platform on a small 125 GB SSD with lots of New Zealand references to Lord of the Rings! Evening was spent touring around Austin to visit North America consulting hosted drinks, dinner with a Cloud Tiger Team lead and then heading home for some rest to keep up with the last day. Speaker had more room than we did! This turned out to be mostly about the community and design meet ups so not a lot of sessions to report on. In the morning Lars Herrmann had an interesting talk on orchestrated containerization with OpenStack. I spent the rest of my day around the booth and when that closed down headed off to lunch with Red Hat Design team leaders. As I fly home I am looking back on a very well organized and fruitful week at OpenStack Summit, would recommend it to any and all for next year. Hope to see you there!